Everyday we face challenges that keep our mind too active at bedtime, preventing us from getting to sleep. Stress-reduction strategies are a good way to create a relaxing bedtime routine, so as to help the body unwind and encourage restful sleep. Chinese massage is mainly based on theories dealing with the organs and meridians. 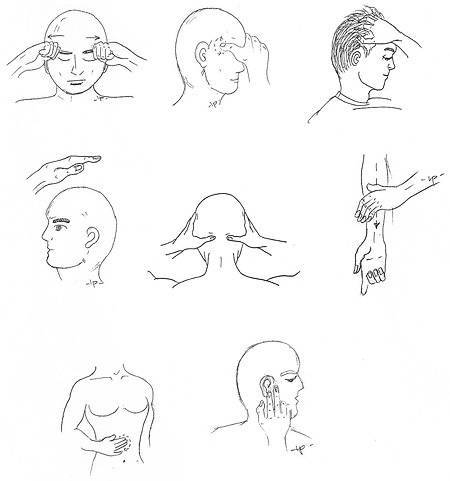 Massage therapists use the fingers to strike, press, knead and pinch to stimulate the acupoints along the meridians and promote the free flow of energy. Despite being applied to the external surface of the body, massage creates signals that induce physiological and chemical changes within the body, helping to restore the internal balance. People often report pleasant feelings and deep relaxation after receiving a massage, the mental pampering effect is just important and valuable as any physical benefit. A full body massage before going to bed is ideal. If not, a short backrub, face and/or scalp massage also helps prepare a person for sleep. Be sure that the massage strokes are slow, gentle, yet firm. Below are simple massage protocols to promote sleep. Rub the inner auricular region for 2 minutes.